I would never have expected to like a show about football and especially high school football in Texas but the writing was so sublime, the characters so well-developed, the acting so terrific I was won over immeidately. I am expecting some nay-sayers on this one but I loved it. Yes, they were spoiled rich kids but so are the characters on most shows. Sometimes I wonder if Hollywood realizes just what the typical viewer house is like. Certainly not like the houses on MODERN FAMILY. Not like the houses on BLOOD LINES. Only on comedies do we get a working class house. Ed Gorman is the author of the Sam McCain and Dev Conrad series. In the course of a year I usually read twenty or twenty five novels that impress me. Some for characterization, some for story, some for milieu. But I rarely read a novel that astonishes me. 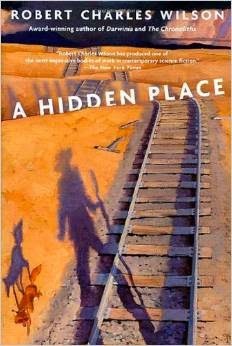 When Robert Charles Wilson's first novel A Hidden Place appeared as a Bantam paperback original in 1986, I wasn't sure what to make of it. I received it along with three or four other science fiction Bantams. I think I put it on the bottom of the stack. The other novels were by writers I knew. Whatever reluctance I felt vanished when I read the first page. The story here concerns a young man named Travis Fisher who is sent to live with his aunt because his mother, a troubled woman, has died. What he finds in his aunt's house is an intolerable uncle who demands that Travis lives by steely rules he himself frequently breaks. He also finds Anna, the strange beautiful woman who boards upstairs. Travis is so stunned by her he can barely form sentences. He also takes up Nancy Wilcox, a smart, witty girl who is bursting to escape the brutal social order of this small town. Parallel to this story line is the one of the odd hobo Bone. Because the novel is set in the worst years of the Depression, Bone becomes our tour guide, showing us exactly how people of various kinds behaved during this time. Bone is a transfixing figure, as mysterious as Anna and perhaps linked to her in some way. I don't want to start listing plot twists here. All I'll say is that each is cleverly set up and magnificently sprung on the reader. What I'd rather talk about is the writing. In the course of reading A Hidden Place, I heard many voices--among them Sherwood Anderson, William Faulkner and the Theodore Dreiser who wrote An American Tragedy. The irony is that Wilson is a Canadian. He may or may not have read any of these writers. But except for John Steinbeck, I've never read place description to equal the power and poetry of Wilson's shantytowns or railroad goons; nor have I encountered a better picture of the small towns of that era. But most of all the book is about people. Wilson's characters will take up permanent residence in your memory. So many of them ache for things they can't have, for things they don't even understand. Wilson writes with a razor. Twenty years later we find that Robert Charles Wilson is a highly regarded science fiction writer, winner of many awards and several lengthy studies. I believe I've read every novel he's published. But much as I love them I always go back to this one. In its sorrows and its griefs and the beauties of its writing, we find a rare kind of truth, a statement about what it means to be human. I count fourteen, among them books by Margaret Millar, Ross Macdonald, Howard Engel, Arthur Stringer, Roderick Haig-Brown and Douglas Sanderson. Right now I’m reading The Unreasoning Heart, for which Constance Beresford-Howe received the 1945 Intercollegiate Literary Fellowship Prize. You’ll find seventeen books by Richard Rohmer, but only because I agreed to join two old friends in reading every one of his thirty-one books. Rohmer’s name doesn’t mean much today, but forty years ago he was Canada’s bestselling thriller writer. Some people still remember his first, Ultimatum (1973), in which an energy-starved United States invades Canada for its oil. Interestingly, his first flop was something called How to Write a Be$t $eller. I’ve also been building a decent collection of nineteenth-century anti-Catholic propaganda – research material for a book I’m writing about the Maria Monk hoax. (http://brianbusby.blogspot.ca/2009/06/maria-monks-immortal-book.html). I don’t have one, though I do come across characters I admire from time to time. As a sad young man, I suppose I would have said Jay Gatsby. 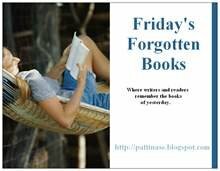 What book do you return to? Memoirs of Montparnasse, John Glassco’s remarkable, unreliable account of his adventures in the Paris of the ‘twenties. It left such an impression on me that I spent eight years writing a biography of the man, A Gentleman of Pleasure (McGill-Queen’s UP, 2011). Born, raised and educated in Montreal, after university I gravitated toward jobs that had to do with the written word: library wholesaler, soap opera writer, radio dramatist (really) and textbook editor. My last salaried employment was as a national buyer for the country’s dominant bookstore chain. It was inevitable, I suppose, that I would end up struggling to make a living by writing books. Most have been published under pseudonym, written to pay the bills; those that have appeared under my own name were done for love at a loss. 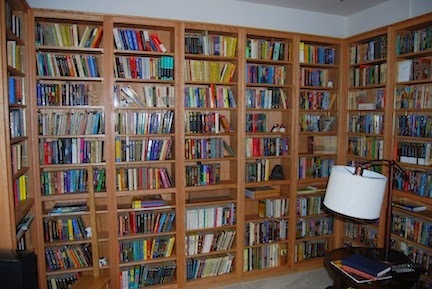 My next, The Dusty Bookcase, is drawn from my magazine column and blog (http://brianbusby.blogspot.com), both of which explore the suppressed, ignored and forgotten in Canadian literature. Still very much a Montrealer, I live with my wife and daughter in St Marys, Ontario, the most beautiful town between Stratford and London. 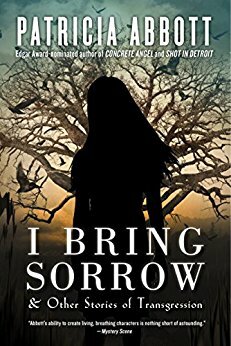 I was looking over amazon comments on THE BEST MYSTERY STORIES OF 2014 and repeatedly saw the comment, "These are not mysteries." 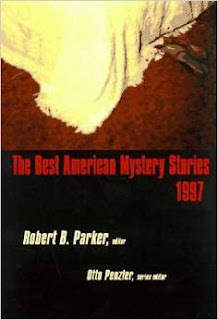 Maybe at the beginning of this series, the term mystery was most often used when discussing stories with a whodunit aspect or PI or police procedural. But now crime fiction is a broader, more encompassing, term for stories that concern a crime, a criminal or sometimes a "mystery." Maybe this yearly collection should only include classic stories. That may be what the typical buyer expects.Or maybe it should be THE BEST CRIME FICTION STORIES. Hard to break with tradition though. What do you expect when you pick up a book like this? Are you expecting the classic mystery story in every selection? How much leeway do you give a story that calls itself a mystery? 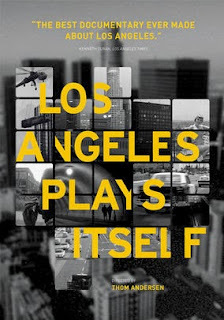 Thom Andersen made this nearly three hour movie, released briefly in 2004, which looks at almost every movie, good or bad, that took place in LA or used it as a setting, or used it as a character. For any movie lover, or noir lover, a real treat. It is available on Netflix Streaming and perhaps You Tube. A bit of trimming probably would have given it more screen time. But I am surprised it didn't turn up until now. (Megan and me on the same rack at McNally Jackson). If you click it you can almost make it out. Scott Montgomery's Mystery People Bookstore is housed inside Book People Bookstore in Austin, Texas, one of the finest bookstores I have ever been inside. novel. I also have Concrete Angel sitting there ready to be read. there own way, they were champions of the working class. she gets better with each one. I will never stop missing typing Ron Scheer's name in here. 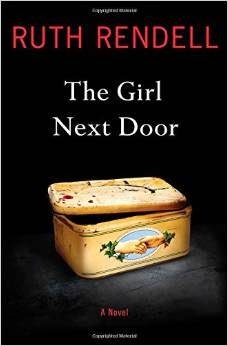 Published in late 2014, just a few months prior to her recent death, Ruth Rendell’s The Girl Next Door was the last Rendell book released while she was still alive. (Apparently, there is at least one additional book slated for posthumous publication.) 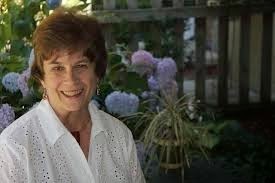 Whether Rendell intended it to be her swan song or not, The Girl Next Door is a fitting coda to her fifty-year writing career. It is a meditation on life, love, aging, loss, and the inevitable compromises that a living a long life brings. 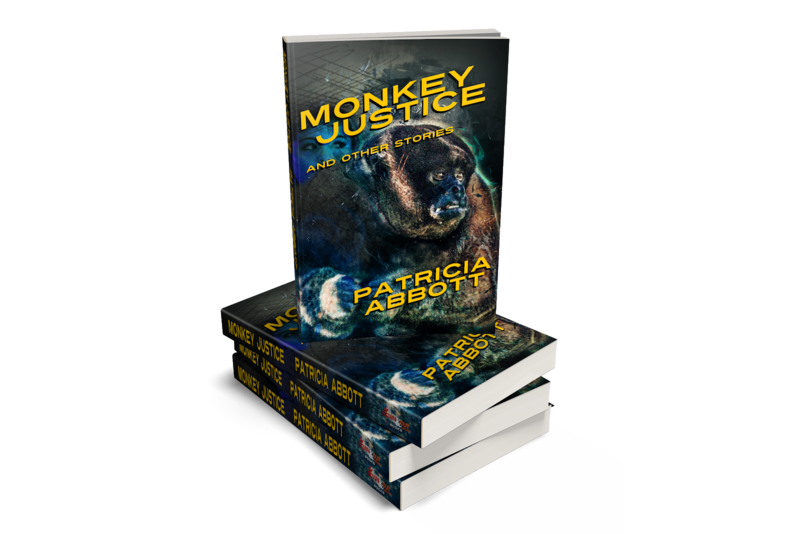 There is a murder-mystery of sorts, but it is virtually irrelevant to the central plot and is a mystery only to the characters in the book; the reader already knows the full story. The murder functions primarily as a catalyst for bringing a group of seventy-something characters together rather than as a neatly-plotted puzzle. 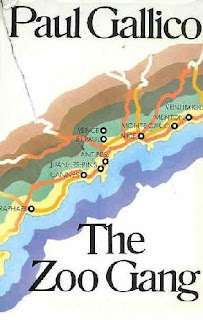 The book begins in 1944, toward the end of WWII, on the outskirts of London. Neighborhood youngsters (none yet in their teens) discover the foundations for a house that was never built. The friends term these foundations the “tunnels” and spend their days playing in them. This group will meet again, many years in the future. As the children play, John “Woody” Winwood, a working-class laborer who has managed to improve himself socially by marrying a wealthy woman, kills his wife and her lover, deciding to remove their hands as a macabre trophy. He places the hands in an empty container and then hides the container in the tunnels. This is not a spoiler, it occurs within the first few pages of the book. Woody abruptly (and menacingly) warns the children to stay away from the tunnels. Woody then sends his son Michael to live with a distant relative. For the rest of their lives, father and son will rarely see each other. The discovery of the skeletal hands some six decades after they were hidden starts a string of events—some positive, some not so much—as the former friends, many of whom have been out of touch since the end of the war, reconvene to share their memories of those days with the investigating police. Now the youngsters who played in the tunnels are in their sixties and seventies, long-married or, in some cases, divorced or widowed, with children, grandchildren, and even a few great-grandchildren. Although the story threads through the lives of a number of friends from the tunnels, primary focus is on Alan and Rosemary Norris and Michael Winwood. Within a few weeks, Alan and Daphne are having an affair—a cataclysmic event for the Norris’s marriage, their family, and their circle of friends. This is not a book that shies away from the sexual side of being a senior citizen; nor does Rendell condescend to her characters or imply that there is something inherently comical about older people enjoying the physical element of romance. I have not read a book that is so matter-of-fact about sexual attraction amongst older people since Mary Wesley’s Not That Sort of Girl. 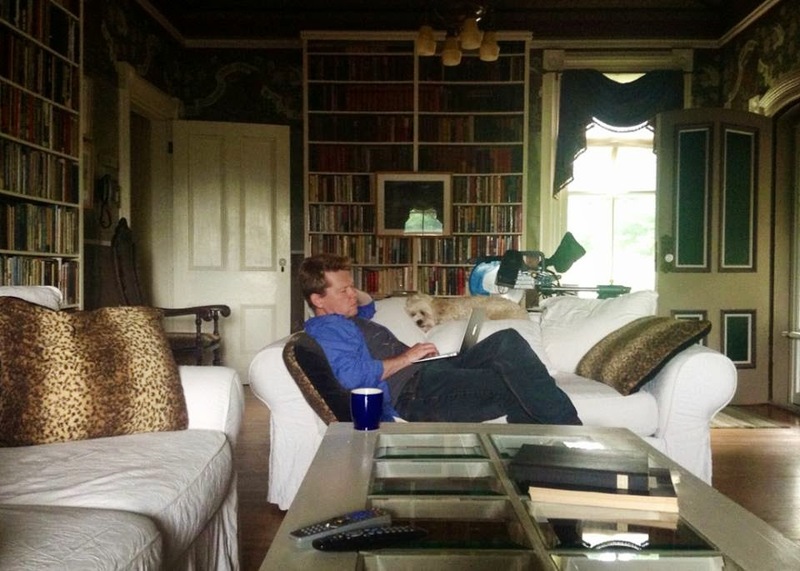 Michael Winwood, the other major focus of the story, is now himself a widower. He mourns his long-dead wife, has a rather casual connection with his adult children, and continues to be haunted by the toxic shadow of his still-living father. Yes, Woody is still alive at almost 100 years old. He is very sharp mentally, living in an upscale retirement home (neatly satirized by Rendell). During most of Michael’s life, he has managed to avoid seeing his father; but, in light of the discovery of the hands, he now must confront him. This is one of the book’s interesting themes: Many of us are part of the first generation in history where people in their seventies still have living parents. How do we relate to those who are our elders when we ourselves are elderly? Do we ever escape that parent-child dynamic? The children of the main characters, themselves in their forties and fifties, find themselves asking the same questions. As might be expected in a book where a number of the characters are well into their golden years, there are a few deaths, but the book is neither depressing nor sorrowful. Those who survive mourn, but eventually continue with their lives, even if their hearts are broken and things will never be the same. The murder-mystery (such as it is) is wrapped up in a rather pat fashion, but this book was obviously not intended to be a traditional whodunit. Admittedly, this is not a forgotten book, but I hope it is one that will be remembered. If it does not rank up at the top of the great Ruth Rendell/Barbara Vine oeuvre, it is still a book worth reading—thoughtful, challenging, and surely a book that Rendell would have been pleased to know would be one of her last. I just finished Prohibition, a 1930s crime tale by Terrence McCauley. Next up is James Crumley's The Last Good Kiss. Then there's The Big Nowhere by James Ellroy, followed by Get Carter and Jack Carter's Law by Ted Lewis. Who is your favorite novelist of all times? Hard to choose just one. Jim Thompson would be right up there, along with James Ellroy, Douglas Fairbairn, and VS Naipaul. Monty Hall's biography might surprise you, because it certainly surprises me every time I see it. I bought it over 30 years ago, because somehow he insinuated his way into my life. Since I've just narrated the audiobook of I, The Jury, I'd have to say Mike Hammer. Jim Thompson's The Grifters. From the first sentence to the last, it washes over me like baptismal waters. I could also easily reread any of Vicki Hendricks' books. so what's the most likely book to be resting on your bedside table? For me, it might be one of the BETSY-TACY series by Maud Hart Lovelace. 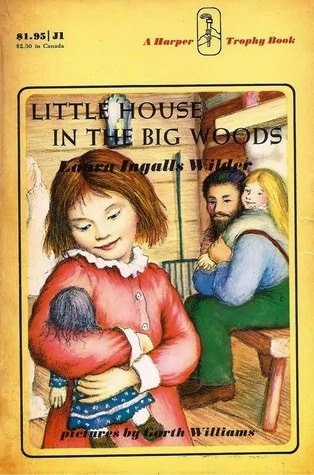 Or a book from the LITTLE HOUSE series. My reading was and is pretty conventional. Oh, and a few pieces of business. 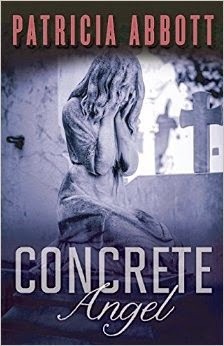 GOOD READS is giving away three copies of CONCRETE ANGEL. https://www.goodreads.com/giveaway/show/139271-concrete-angel. If you can put it on your books to read, that would be swell. Also if I have not sent you whatever piece of writing I promised for my blog tour, let me know. Things got misplaced during the move and I might have missed you. Or if you want to host me and didn't answer my first cry for help, let me know. I still might have something to say about the book or the state of the world. Back in 1988, I thought I could write. HA! Sure, I had a couple of non-fiction books and a half-dozen short stories published, but I always wanted to write a book of fiction. Flash forward trough almost 30 years of -- father of three, tennis enthusiast, Francophile, ex-marketing exec at Exxon, AT&T, and IBM, happily married for 45 years-- and we come full circle to AAA, Author Again At last. Meet Eliot Cross, Columbus-based P.I. in 1988. A series of serious crimes: Kidnapping. Murder. Art Thief. Blackmail. Comic Books. 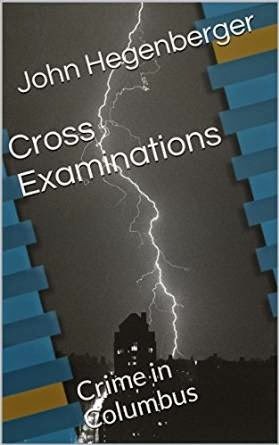 Private Investigator Eliot Cross faces heartache, headache, backache, and a royal pain in the neck in these rollicking noir stories from the heart of the Heartland. 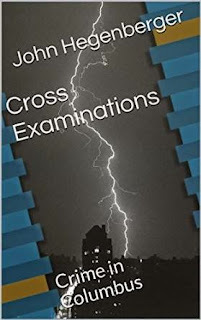 Cross Examinations, Inc. established in 1988. If I had to choose a movie that made me cry as a kid, this would top the list. Olivia plays a woman who must give her illegitimate child up during war time. She follows him from afar and near, trying time and again to figure out a way to let him know their real relationship. None of it works. And it is not until another war that a friend finds the way to tell her son that she is is real mother. This one practically bust my gut. DeHavilland won an Oscar for this part.Was there ever a better actress at playing suffering in silence parts? What is your favorite tear jerker? Who is your all-time favorite novelist? 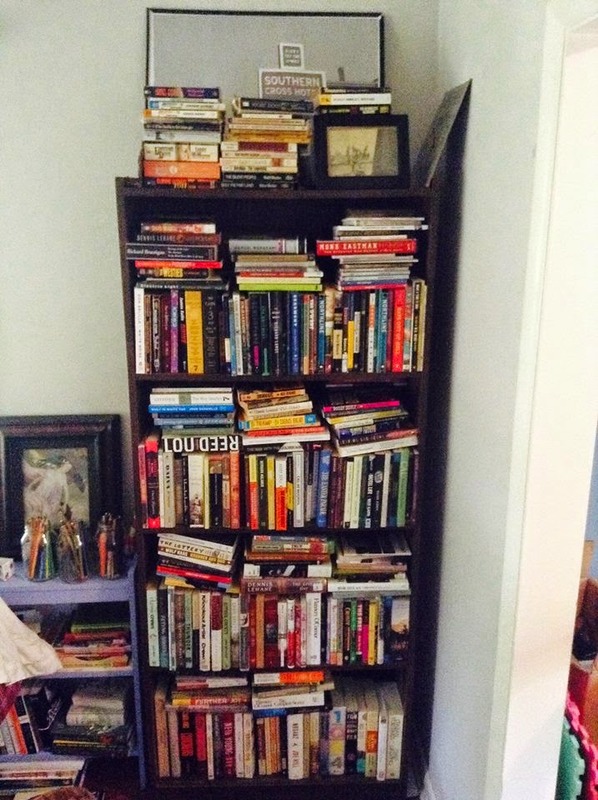 What book might we be surprised to find on your shelves? William Boyle is the author of GRAVESEND and the short story collection, DEATH DON'T HAVE NO MERCY. He teaches writing at University of Mississippi and is from Brooklyn. 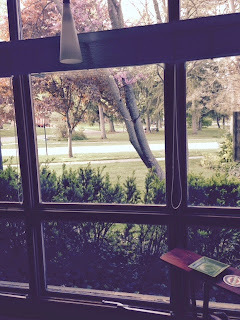 Bessie Smith "I NEED A LITTLE SUGAR IN MY BOWL"
I have to leave here to attend my grandson's school at 8:00. I will add any links not up when I return around noon. 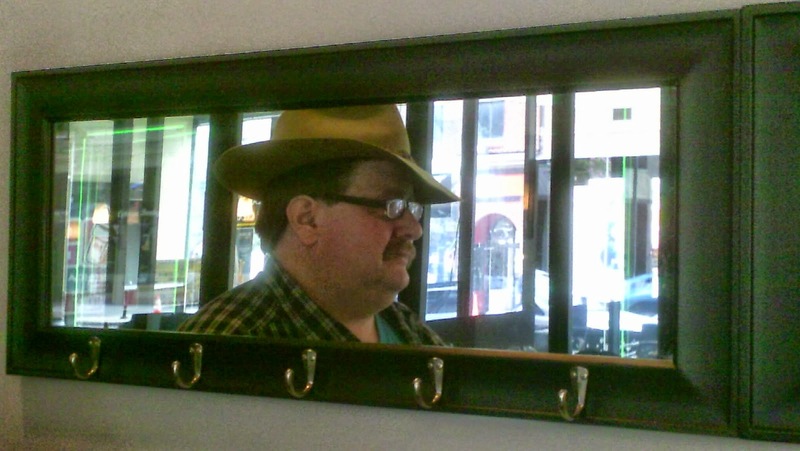 Neil S. Plakcy is a U.S. writer whose works range from mystery to romance to anthologies and collections of gay erotica. He has twice been a finalist for the Lambda Literary Award for Best Gay Men's Mystery Novel. When I was a teenager I read everything by Paul Gallico that I could get my hands on, from his comic Mrs. 'Arris novels to the tear-jerker The Snow Goose, right up to The Poseidon Adventure, from which the blockbuster movie was made. 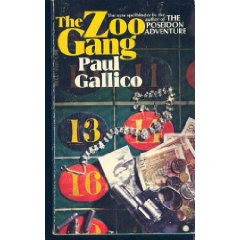 But my favorite was a book called The Zoo Gang, which is so far out of print these days that Amazon can only find one used copy.The jacket of my paperback edition calls it a caper novel, though really it's a collection of four stories, and they are more puzzles than capers. The protagonist is Colonel Pierre Roquebrun, proprietor of an antiques store in La Tourette, on the road between the towns of Vence and Grasse, in the back country of the French Riviera.In his youth, Colonel Roquebrun aka Le Renard, or the Fox, led a group offighters in the French Resistance. They include the Wolf, the Elephant, the Leopard and the Tiger, and though all are in the evening of their lives, they are still as clever and cunning as they were during the Second WorldWar. In "The Picture Thieves," the first of the four stories, a French police detective comes to Colonel Roquebrun for help investigating a series of art thefts. The puzzle involves not only how the paintings could have been stolen, but how to parlay the knowledge of that theft into the prevention ofan entirely different crime. This story introduces the members of the ZooGang as well as their specialties during the war. The characterization ispretty shallow, though, because Gallico's emphasis is on the details of the crime. In "How to Stick up a Fifty-Million-Dollar Gala," the five friends engage in solving a similar puzzle. "Snow Over the Cote d'Azur" is the longest of the stories, in which Roquebrun's niece dies of a drug overdose, leading him to go after the suppliers of drugs into the Riviera. The final story, "LeSnatch Double," is another marvel of complicated plotting, in which two children are kidnapped, and a terrible price is exacted for a piece of wartime treachery. Rereading it now, I'm less impressed than I was as a teenager. The characters are flat, and I never was able to keep a handle on the other animals beyond the Fox. There isn't much of a real sense of the Riviera, either, beyond a few place names and some details of the floats in Nice'spre-Lenten Carnival. But the puzzles are very clever, and it's an interesting insight into the kind of men who fought in the French Resistance. 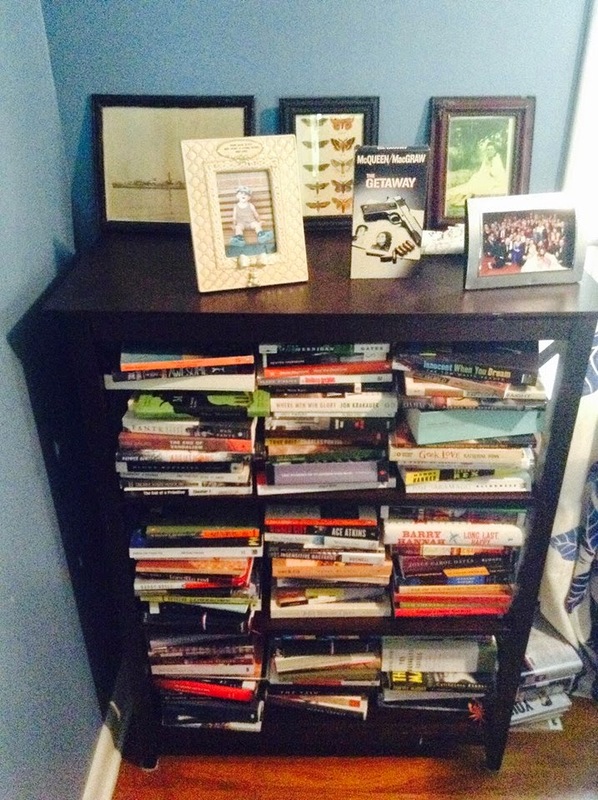 My nightstand is actually a small bookcase, as the stacks on the nightstand and dresser got a little unmanageable. 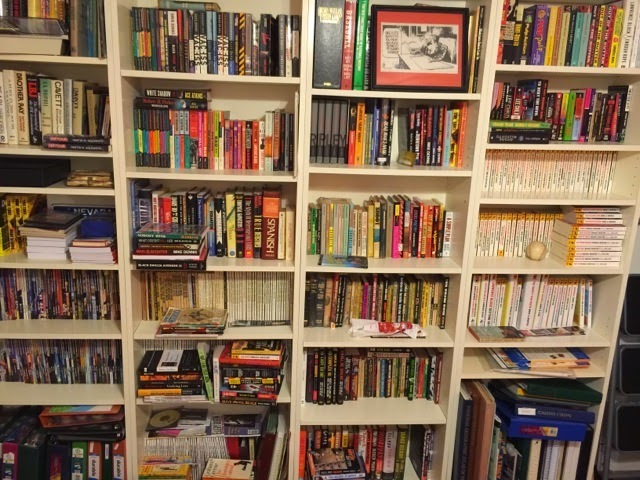 In that bookcase just now are about 25 books, including Old Mars edited by Martin & Dozois, The Python Pit by George F. Worts, The Gift of Rain, by Tan Twan Ing, Bodies Are Where You Find Them by Brett Halliday, Silver Totem of Shame by R.J. Harlick, Behind That Curtain by Earl Derr Biggers and The Dragons of Ordinary Farm by Tad Williams and Deborah Beale. That’s just a sampling. It’s about half mystery and half science fiction - fantasy with a few other things - like the Ing - tossed in. The answer might depend on what day I’m asked, but I usually answer that question by naming Lawrence Durrell. Tolkein is also strong contender, as are Agatha Christie, Anne McCaffrey, Raymond Chandler, Robert Heinlein, Poul Anderson and many others. Hard to say what might surprise someone. I’ve got a lot of pulp reprints, such as three volumes of stories about The Green Lama by Kendell Foster Crossen, science fiction paperbacks I bought in the late Fifties and lovingly read and preserved, a set of the Pogo books by Walt Kelly, hardcover editions of all of the Redwall series by Brian Jacques, books about American muscle cars, mystery reference books including Hubin and many others, books on architecture, gardening, lots of things. Mostly it’s mystery and SFF. Another question with too many answers. Maybe…Sherlock Holmes, or Lew Archer, Nero Wolfe, Miss Marple, Nicholas van Rijn, Inspector Gramache, Honor Harrington, Joe Leaphorn, too many to pick one. There are many. I reread The Lord of the Rings by Tolkien every three or four years. I’ve read the Alexandria Quartet (Justine, Balthazar, Mountolive and Cleo) twice times and I’ll read it again. I re-read Chandler, Christie, Heinlein, David Eddings and I reread a lot of poetry, including Tennyson, Longfellow, Blake, Whitman, many others. 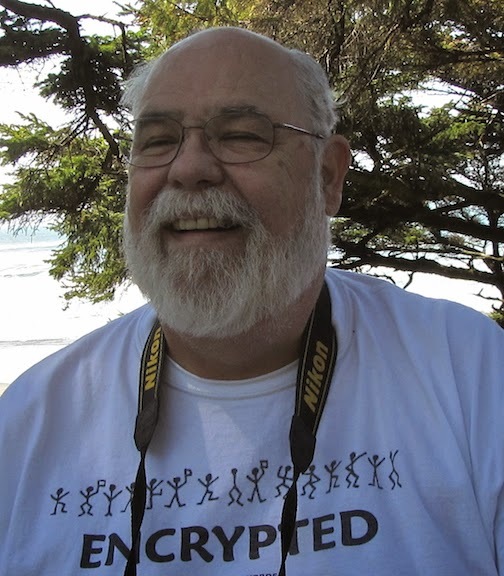 Bio: Grew up in Southern California in the Fifties and Sixties, attended the University of Arizona and Otis Art Institute, read science fiction as a boy and still do, added mystery fiction in college. I listen to mostly jazz and classical music, joined the mystery apa DAPA-Em and published The Perp until 2009, moved to Portland, Oregon the following year. Married, have three cats. I read a lot. And half of the place is still in chaos. The problem is although the square footage is about the same, it is very different in terms of things like wall space, storage, individual room size. 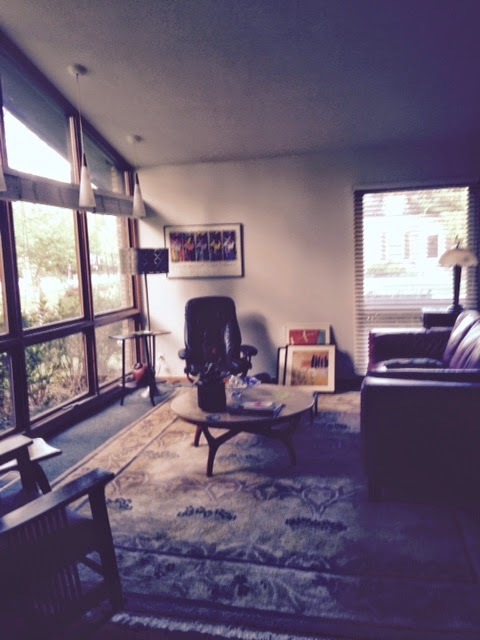 So much of the house is windows, we can't hang even half of the art (and I use that term loosely) we had in our old house. 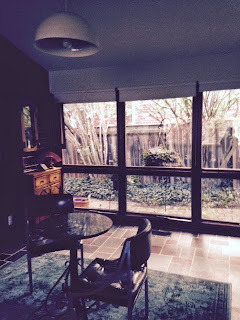 And it looks lousy if you put furniture in front of windows. We donated 11 pieces of furniture to Habitat for Humanity, 900 plus books to the AAUW but we are still drowning in our excess. 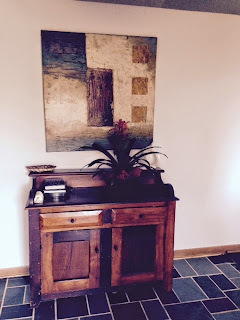 There is no room, for instance, in the bedroom for a bureau unless you want to trip over it at night. So I have to try and find some sort of IKEA thing to put in the closets. However, someone thoughtfully built shoe racks into the closet wall limiting us to very little depth to use. And whoever built this house must have been a giant because the shelves in the closets are six feet up. 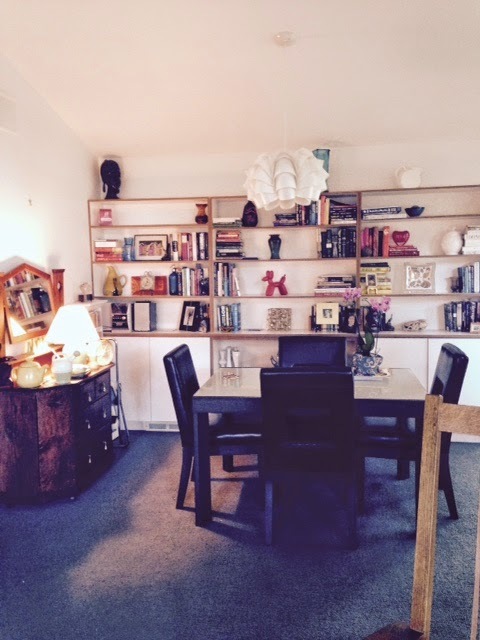 I have already strained by calves by reaching on my toes for the shelves. And here's another thing, we are 17 years older than the last time we moved and run out of steam a lot sooner. We are hoping to be settled in another week but the garden needs lots of work and we need a crackerjack handyman for inside. What is the best thing and worst about your home? Abbott, a prolific Derringer Award–winning short story writer, explores an unusual and complex mother/daughter bond in her enthralling, dark debut novel. Twelve-year-old Christine adores her beautiful and charming mother, Eve, and when a shocking act of violence threatens to tear them apart, Christine takes the blame, which sets the stage in the years to follow. Eve is compulsively acquisitive and amasses thousands of items that she’s bought or stolen. After Hank, Christine’s father, finally has had enough, Eve goes through a string of men who enable and even encourage her larcenous, obsessive behavior. Things come to a head when Eve begins using Christine’s little brother in her schemes, and Christine plots to break the cycle. VERDICT Abbott alternates the narrative between Christine’s voice and a third-person point of view that follows Eve and her relationships. The author perfectly captures not only the life of a girl whose adoration of her mother morphs into mistrust and loathing but sets the story in 1970s Philadelphia when gender roles were taking on new definitions and alternative ways of treating the mentally ill were gaining traction. It’s a potent and at times poignant combination. Those who enjoy suspenseful, atmospheric family drama will find much to love here. And a big thanks to S. J. Rozan, Meg Gardiner, Naomi Hirahara, Alison Gaylin, and Sandra Scoppettone for giving me the boost of a great blurb. A Short History of Stupid by Bernard Keane and Helen Razer (this is non-fiction, I've been reading a chapter at a time over the past few weeks), Yrsa Sigurdardottir's Silence of the Sea and Arthur Upfield's Wings Above the Diamantina (although to be truthful this is on my phone as it's an audio book but the phone occasionally rests on my nightstand). Who is your favourite novelist of all times? I don't have one. 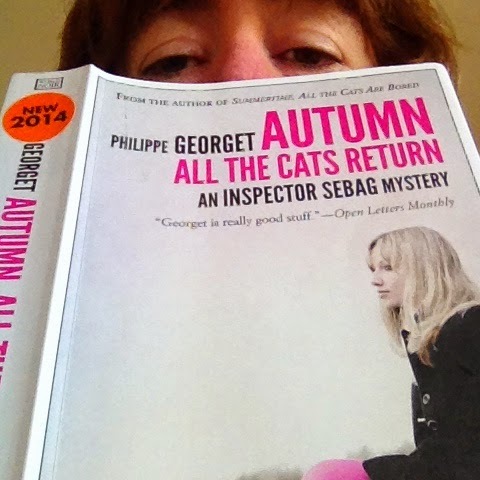 I'm 47 - far too old and with far too many books under my belt now to have just one favourite. I imagine different people would be surprised by different books. 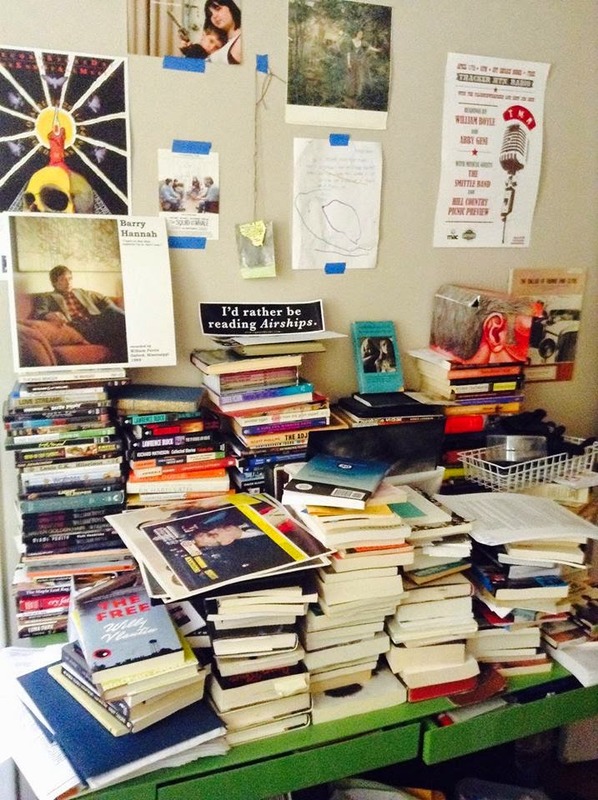 Last year I was a judge for Australia's Ned Kelly Awards and when I'd finished with the large pile of books I took them into my office and left them in the tea room with a 'help yourself' sign. People kept stopping me to exclaim that they'd never pictured me as a reader of that sort of thing (most of these comments were at least mildly derisive though the process did reveal a fellow devotee of the genre and we now share recommendations and swap books with much enjoyment). 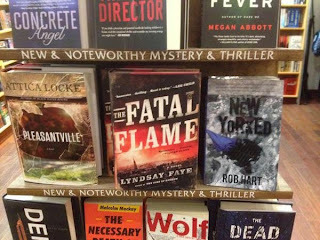 Conversely the people who know me from my blogs - where I talk about crime fiction almost exclusively - might be surprised to see the historical fiction that doesn't involve murder or the entire shelf devoted to non-fiction books about religion and its troubled history and place in our world. A recent houseguest was astonished to find a non-fiction book about sports on my shelves. I am (in a very un-Australian way) not very interested in sports at all so the fact a well-read copy of Keith Miles’ Not for Glory, Not for Gold has a place on my shelves is legitimately surprising. It's the story of the athletes who strove to be the first to run a mile in under four minutes. I don't remember where I picked it up but I do remember being utterly captivated by it. She is reclusive, opinionated, proud, distant and is disenchanted with her fellow humans as a species. She is also independent, a loyal friend and a woman of action. As the story opens she is bitterly disappointed, bereft almost, at the loss of her dream and all it represented. And yet she gets on with the graft of living. No breakdowns or wallowing in self-pity for her. Thea is my kind of hero. Probably the books I have returned to most often over the course of my life are Douglas Adams' Hitchhikers Guide to the Galaxy and Jane Austen's Pride and Prejudice (both read for the first time the year I turned 13 but I don't know if that is significant in terms of my development or purely coincidental). Geraldine Brooks' Year of Wonders is a frequent return visitor to my nightstand too. 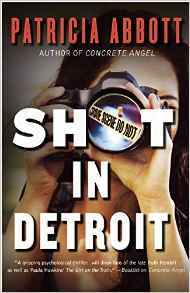 I tend not to re-read crime fiction though Ken Bruen's The Dramatist and Adrian Hyland's Gunshot Road are exceptions. Both authors write like poets. 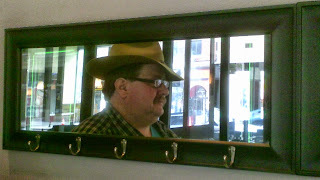 I’ve been reading avidly for as long as I can remember, blathering about the subject since late 2008 at Reactions to Reading and am co-host of Fair Dinkum Crime, a site devoted to promoting and discussing Australian crime fiction. I have twice been a judge for one of our national crime fiction awards and for the last three years I’ve been one of a team of coordinators for the Australian Women Writers Challenge which aims to get people reading and reviewing books written by Australian female authors.